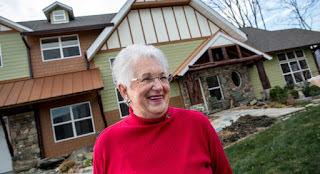 WataugaWatch: Virginia Foxx: "A Foolish Consistency Is My Hobgobblin"
Virginia Foxx: "A Foolish Consistency Is My Hobgobblin"
Rep. Virginia Foxx said on Friday she supports Trump’s ability to declare a national emergency in order to build his wall. In 2014, when President Obama asserted his executive authority to protect "Dreamers," Foxx had a fit that he was acting like an emperor. Funny, now that Foxx is cheerleading Trump's boasting that he has the supreme authority to build his wall. Criticizing Obama for trying to protect the Dreamers while seconding Trump's attempt to hurt others. That's a lovely irony for a woman like Foxx, who's built her fortune on the backs of immigrants and knew a Dreamer or two that she wouldn't stoop to help (according to the persistent rumors).